Reintegration refers to the process of reunifying a displaced, trafficked or abandoned child in Umbrella’s care with their family. This involves ensuring that the situation at home is stable and the child’s needs can be met in a caring environment. “… the best place for a child … is with their family” (Un Convention on the Rights of a Child). Umbrella is committed to the safety, health and happiness of the rescued children in our care. The UN Convention on the Rights of a Child indicate that the best place for their psychosocial development is with their family or community of origin. Umbrella shares this stance and, where possible, we have strived since 2009 to return these vulnerable, isolated children from short-term housing back into a network of familial support and security. 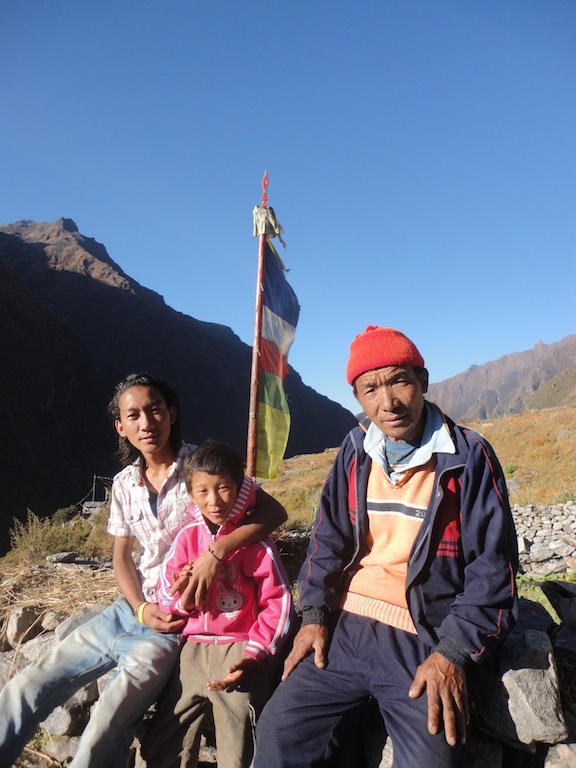 Jalman (middle) at home with his brother and Step Father in Langtang. In the early days, Umbrella worked closely with Next Generation Nepal (NGN) to re-connect our children with their families and communities. Our reintegration officers and the NGN team travelled the country searching villages for the children’s families, with nothing but photos, letters and scraps of information to help find them. Umbrella have since hired a dedicated team who have become renowned in their own right for operating an effective and successful reintegration programme, and have been approached by other children’s homes to support similar endeavours in an advisory capacity. For some of the children in Rasuwa, it was not deemed suitable to fully and permanently reintegrate them as there was no local school for them to attend. 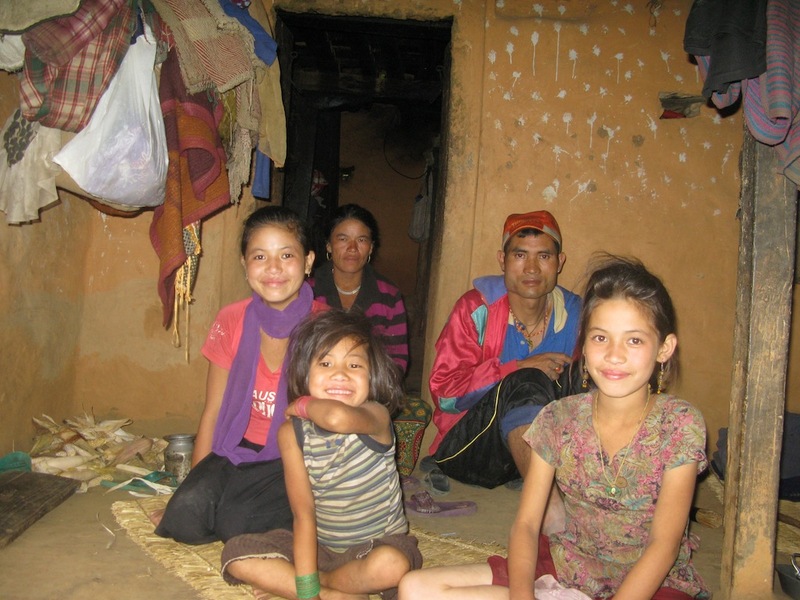 Therefore, Umbrella established a foster care home in Syaphrubesi, Rasuwa in 2011 to accommodate them in a safe, family environment where they were looked after and attended school. Here, they were also close enough to their family homes that they can visit on weekends/public holidays and are growing up immersed in their own cultural and traditional environment. As the majority of the homes that the children were rescued from cared little about their well-being, they kept no official records of their backgrounds. Our team tries to salvage as much information as possible from the children themselves and from whatever records we can uncover. Convincing parents that their child is better off within the family unit is difficult, especially when they see that they are receiving a good education and are being well cared for by us. Although a basic home and living, Yanzen (left) and Yu Dolma (right) are happy to be back living with their little sister and parents! We must also accurately assess the family situation and ensure that they are financially capable of taking over care of their child. When reintegration is in their best interests but there are financial constraints, Umbrella offers assistance by paying the child’s school-related costs and living expenses. Many Umbrella children are orphans, having lost at least one parent during the civil war. In cases where the father or mother has died, the family’s financial condition is often extremely poor and too unstable to support their child. And where neither mother nor father are living, it is difficult to trace relatives and burden them with the care of an additional child. Finally, where a mother has re-married, the child is often not welcome into this new marriage. It is a sad fact that many of the families were involved in the trafficking of the child in the first place, thereby creating a risk of repetition. After every reintegration there must be continuous follow-up visits by our team to monitor the children’s progress and to assess the success of the process. We have rescued over 400 children. There have been over 200 successful permanent reintegrations. Most of the children in Umbrella have been reconnected with their relatives or family members. For the small number of children who are orphans, we also promote foster care arrangements, and currently have 5 children in foster care with families they have known for many years. Family InformationCollect the child’s details regarding birthplace, parents, relatives, siblings, how and why they reached their present circumstances, and who was responsible for bringing them to Kathmandu. Family TracingLocate their family through field visits and the cooperation of local authorities, and collate further data on their background. Family AssessmentMeet the family to determine the reasons for the child’s separation – medical, educational, economic, social – and to discuss the factors likely to bring about a successful reintegration. Family CounsellingIdentify and give value to the family’s existing economic, social and emotional status as a unit, and offer encouragement and advice to support the child’s eventual reintegration. Child CounsellingAssess the psychological, social and legal factors likely to impede reintegration, discuss the disadvantages of institutional care, and explore the long-term personal development, cultural identity and family value benefits of returning to their community of origin. ReintegrationFormulate a long-term, permanent family/relative reintegration strategy, community foster care plan or, as a last resort, institutional care arrangements. Reintegration SupportProvide the family with regular financial and emotional support, regularly monitoring the child’s health, social, educational and psychological development. Future PlanOutline strategies to encourage the child’s eventual independence and self-reliance as a responsible adult.